Each piece of Sunset Hill Stoneware is made using an old-world process that gives it a unique, handcrafted appearance and quality. Unlike other potteries, Sunset Hill Stoneware's products are made one at a time, hand thrown on the potter's wheel rather than using slip cast molds. Classic yet exquisite, the extraordinary quality of this mug is the extra pick-me-up to keep you refueled and recharged for every challenge. 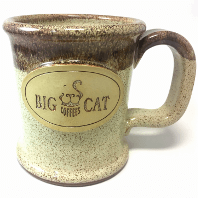 Skillfully handcrafted in Wisconsin — 14 ounces; 4.25”h. Dishwasher, microwave and oven safe. 100% lead-free. FDA and California Proposition 65 compliant. Ounces may vary. Due to the nature of handmade processes, styles and glazes will vary in consistency resulting in unique appearances. Cinnamon Roll is a two-tone glaze based in oatmeal and topped with sweet temptation.